This remarkable upcycling process turns discarded waste into something beautiful. 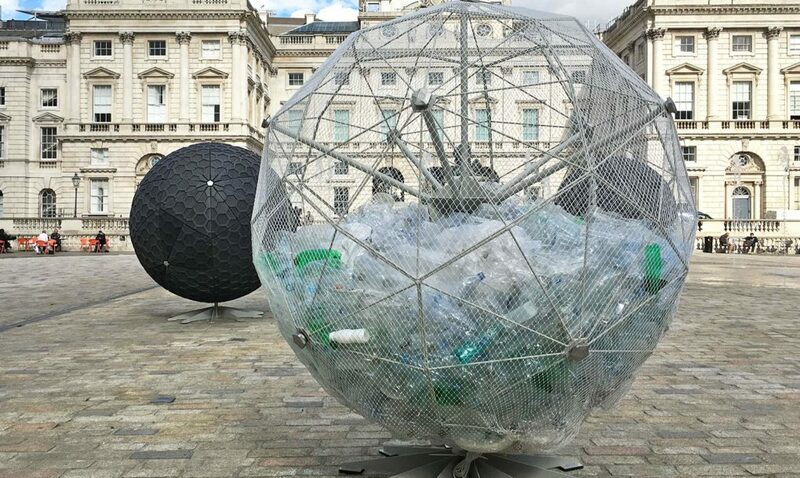 At London Design Festival 2017, an enormous, solar-powered, mobile recycling plant popped up outside Somerset House in Central London. Developed by Miniwiz, a Taiwanese company dedicated to upcycling consumer and industrial waste, the machine turns discarded plastic bottles into beautiful, architectural tiles. 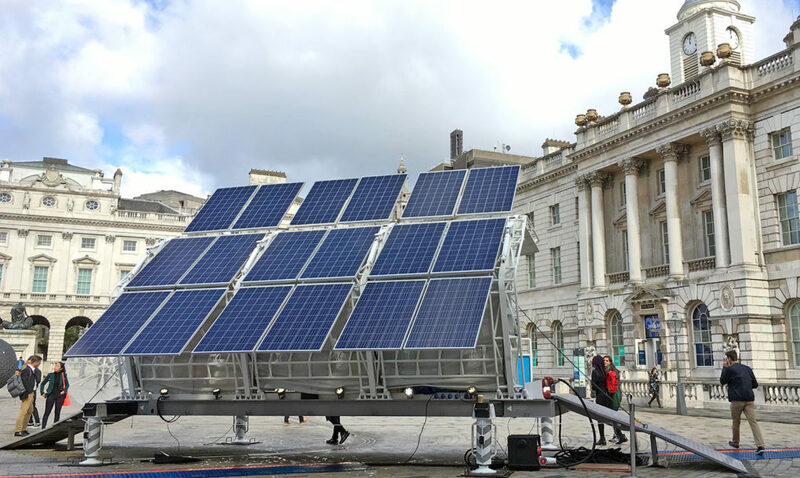 Dubbed the Trashpresso, it is reportedly the world’s first off-grid, industrial grade recycling solution. 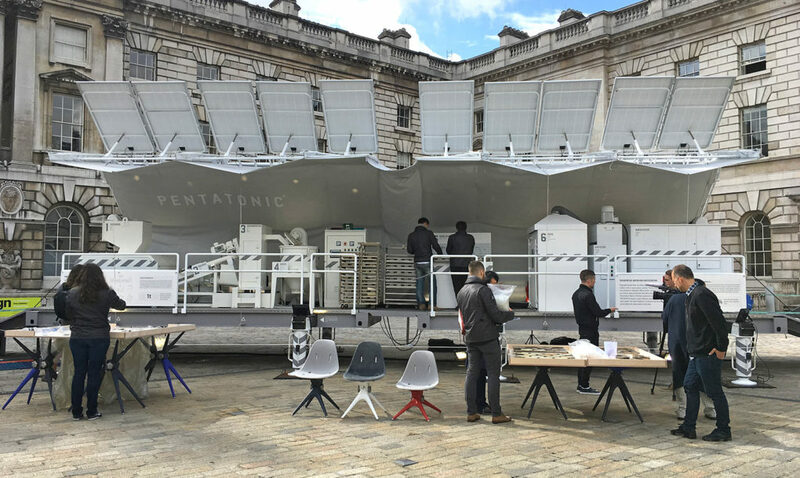 In partnership with London Design Festival, Pentatonic – a Berlin and London-based furniture design company that has resolved to use only post-consumer waste in their products – decided to set the machine up in a public space so that people could see first hand its capabilities. 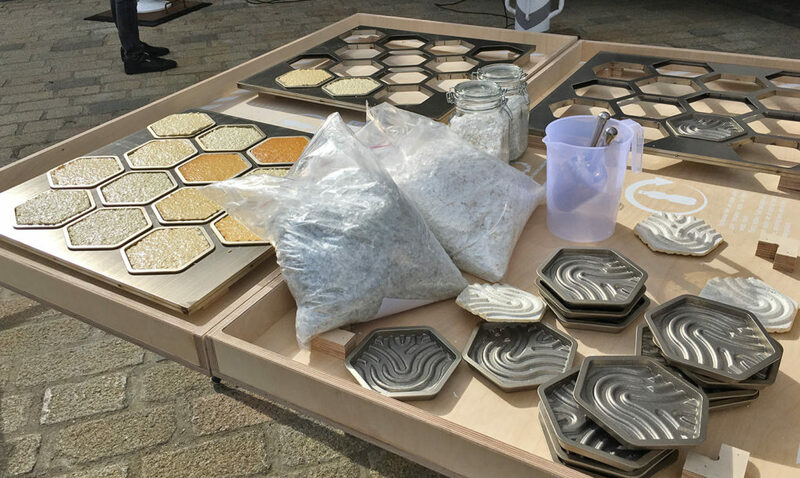 Visitors were encouraged to bring their unwanted plastic bottles to the site where they could watch the process that transforms the material into durable tiles. Compacting the recycling process into five simple steps – shredding, washing, air drying, dehumidifying, and baking – the Trashpresso can upcycle up to fifty kilograms of waste per hour. 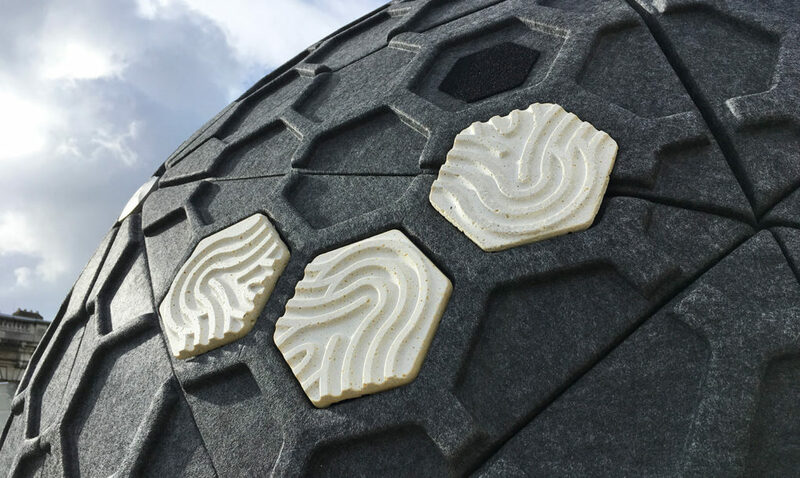 Versatile and weather resistant, the tiles it produces are made from the Polyethylene Terephthalate – known commonly as PET – extracted from the recycled plastic and, once compressed into the tile format, becomes far less heavier and easier to transport. The size of a standard 40-foot shipping container, it can be moved just about anywhere a tractor trailer can reach. Designed to be mobile and functional in isolated locations where traditional recycling plants aren’t a feasible option, the Trashpresso needs to be self-sufficient in order to do so. For this reason, the machine runs on solar power. It also leaves a zero water footprint, as every litre it uses is looped back through three steps of filtration: quartz sand filter, ultrafiltration, and reverse osmosis. "Until now, industrial grade recycling was limited to plants," Arthur Huang, co-founder and CEO of Miniwiz told New Atlas. "The Trashpresso overcomes the distance and energy barriers by showing that recycling is possible everywhere. Not only does it serve to transform trash on-site, it also serves as an educational tool in isolated communities." Visit trashpresso.com to learn more about this revolutionary invention.